Want to lend a helping hand to a very bustling White Plains Public Library? Come to the volunteer orientation on Tuesday, November 28 at 7 p.m. in Room A on the second floor. Library Assistant Director Kathy Degyansky will give an overview of the programs, and the attendees will list their skills, hobbies and passions on the application forms. Then, in the coming weeks, each attendee will individually meet with Degyansky for placement. Another program is conversational English with those who speak it as a second language. “Many are professionals and spouses who are transferred here and want to be more comfortable in their new surroundings,” says librarian Austin Duffy. 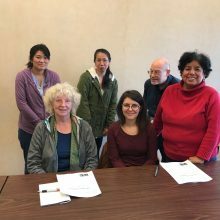 A recent class led by Curt Constable (a pharmacist who found a second calling) had participants from China, Colombia, Germany and Japan. “The experience has been as rewarding for me as it has been for them,” he says. Degyansky can be reached at (914) 422-6965; kdegyansky@whiteplainslibrary.org. Hi. I am a high school sophomore and am wondering if I may volunteer to help at the library. I am responsible, reliable and have excellent grades in school I can follow directions and will ask questions if I am unclear about what I am supposed to do. My teachers are willing to give me a great reference. I know about library work because my older sister has worked at the Yonkers library as an intern and is currently working at the NYPL as a technical page. She is a college sophomore and is interested in library science as a career. Maybe I can help you? Do you take teen volunteers? Thanks for your interest in volunteering at the library! The best way to do this is to attend meetings of the Do Gooders, our community service group for teens. We’re meeting this Friday, 12/1, at 4 pm in the Edge Media Lab. If you have any questions, please feel free to call or email me: 914-422-6945 or kcarroll@whiteplainslibrary.org.